Fox Plumbing & Heating has been supplying our neighbors with cost effective tankless water heaters for over 10 years in Seattle and King County. With the ever-increasing cost of water and heating it’s great to have the chance to find new ways to save money. To find out how Fox Plumbing & Heating can save you money, call us at (206) 654-4990 to speak with one our plumbing professionals about a FREE estimate! We're here for quick and reliable tankless water heater repairs, installations and service. See what some of our past customers have to say about our services here, and call us to schedule an appointment in Seattle, Renton, Sammamish, Kent, Bellevue or other areas of King County! Tankless Water Heaters are high-powered water heaters that heat water on demand as it flows through the system. They don’t have a storage tank that has to continually keep the water at 120 degrees like a traditional tank. 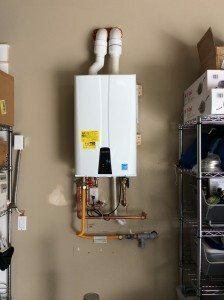 Tankless Water Heaters are able to be installed in a Seattle or King County home at multiple points-of-use, and they are able to keep the entire home in endless hot water. 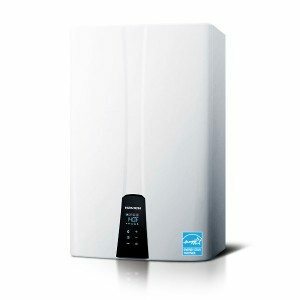 Advantages of Tankless Water Heaters, include; continuous flow of hot water and energy savings. In Seattle we’ve seen savings of over 40% for the average household’s water heating costs. Are You Worried About the Rising Cost of Water Bills? A Tankless Water Heater will save you, on average, over 40% annually on your water heating bill. A Tankless Water Heater is up to 97% Efficient. Working with our Plumbing Professionals at Fox Plumbing & Heating will ensure you get a Tankless Water Heater that is the right size and type for your needs. And we’ll provide award winning service and make sure that you’re only paying for the hot water you’re using. 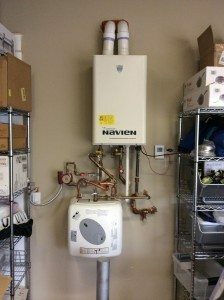 Average Life of a Tankless Water Heater? A Tankless Water Heater has a warranty of 15 years, and with proper maintenance, you can expect to not have to replace it for 20+ years. A traditional water heater is only expected to last about 10 years. 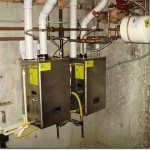 Tankless Water Heaters have a stainless steel heat exchanger, and therefore they won’t rust. 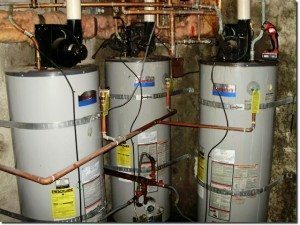 Traditional water heaters are steel tanks and will rust out over time. What’s the Importance of Efficiency? When we say that a Tankless Water Heater is 97% efficient that means that you are only losing 3% on every dollar you spend on your water heating bill. With a traditional water heater you’re usually losing about 40% of your costs. Here is a job that we just did in Burien, WA. We removed the recirculation system to make it more efficient for one of our customers. Here are the before and after photos of the type of work we can do for you. If you are ready to start saving on your water heating costs give us a call at (206) 654-4990. We are the Seattle tankless water heater experts with over 50 years of experience that ensure the job is done right, the first time. Why Choose Fox Plumbing & Heating in Seattle and King County? With over 50 years of service to the community, Fox Plumbing & Heating in Seattle and King County has made it our mission to provide our neighbors and customers with premium and professional service every time. We strive to treat every customer as a friend or family member, and we plan on having a lifelong relationship with each and every one. With the top training for all of our pluming professionals and heating specialists, we are constantly growing our knowledge about the industry and how to provide the best service in Seattle and King County. If you’re considering switching your traditional water heater tank for a Tankless Water Heater then contact Fox Plumbing & Heating at (206) 767-3311 in Seattle and King County for more information. How would you like to never run out of hot water and at the same time lower your energy bill and help save the environment. Fox can fit your home or business with one of these money saving wonders.